Hi! 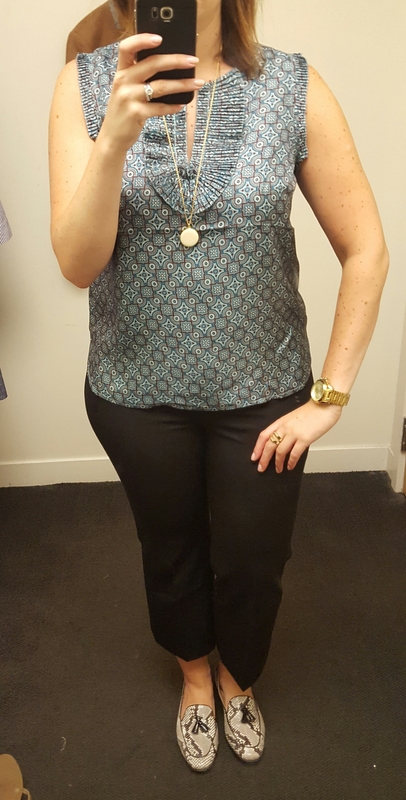 As promised, I’m back with part two of my September 2016 J.Crew try-on session last week. You can see part one in this post. First up, the Colorblock Stripe Ponte Dress. I cannot walk by a striped dress and not try it on. This dress runs big. 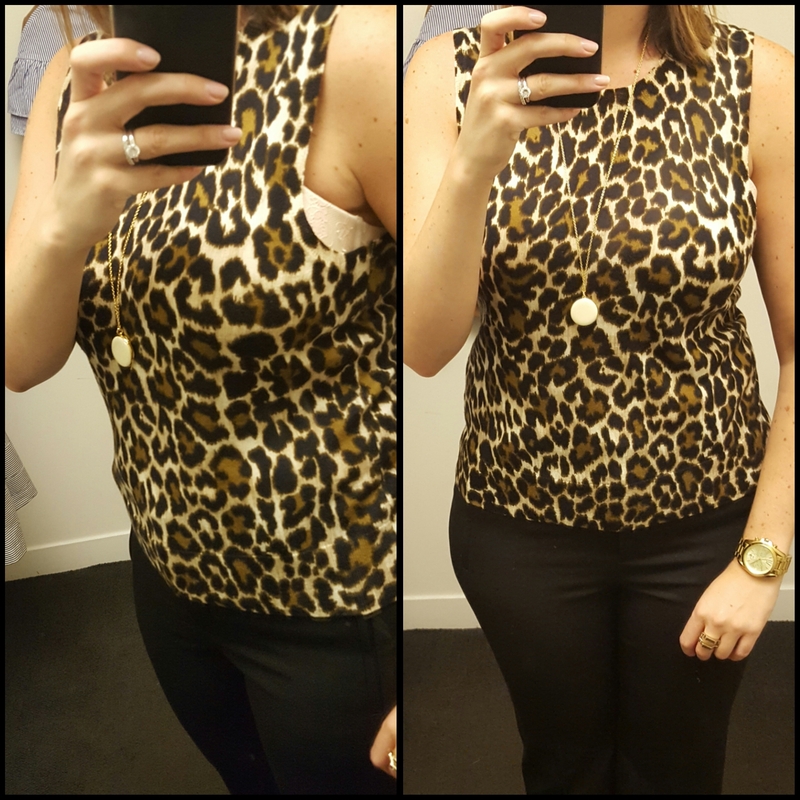 I think it looks better in the photo than it felt on me in the dressing room – I felt like it was just a tad too tight and short for my comfort. This is a medium and is definitely hugging my curves. I didn’t try the large, but the sleeves are bigger than the body in this dress and while I would have appreciated the room in the hip/length in a large, the arms would have been huge and odd looking since they’re 3/4 length. I would size down in this one. As you can see, length is above my knees but it’s a cute toss on and go weekend dress. It was a substantial weight too, not too thin or super thick, it reminded me of the maritime dress from a few years ago. 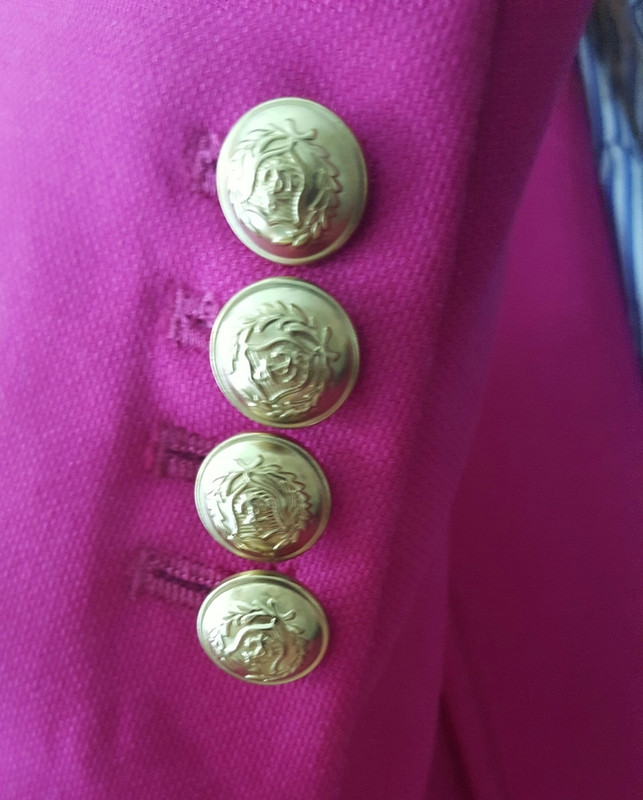 Next up is the Rhodes Blazer in Wild Flamingo. I ordered this online when it was showing low stock and my store was practically wiped out of it as well. This is my first time trying the Rhodes Blazer and I would say it runs TTS to a bit large. I think the cut is flattering but I had to double check that this was actually wool. As I noted with the Rhodes pants, this is a woven wool – it’s not what I expected at all. I’m used to my (non super 120s) wool blazers to be a little softer and the woven material was really throwing me off. It’s a warm jacket and the saturated pink is beautiful. However, I do have the pink Schoolboy blazer (and a pink wool hacking jacket…and a wool pink Bella jacket) from a few years ago so I’m not sure another of these blazers is totally necessary. 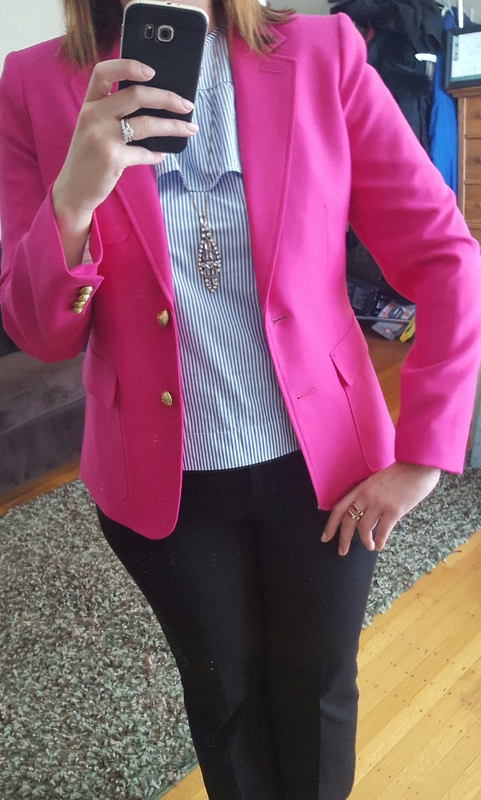 Let’s just say I was on the bright pink blazer bandwagon well before J.Crew determined there are 226 shades of pink. I’m still kicking myself for not grabbing the peppermint pink blazer from last year. I digress. The gold buttons aren’t a deal breaker for me but I would prefer them in a more muted tone. I’m a 10/12 in blazers depending on the blazer and this is a 12. Here’s a closeup of the buttons and you can see the woven nature of the wool. 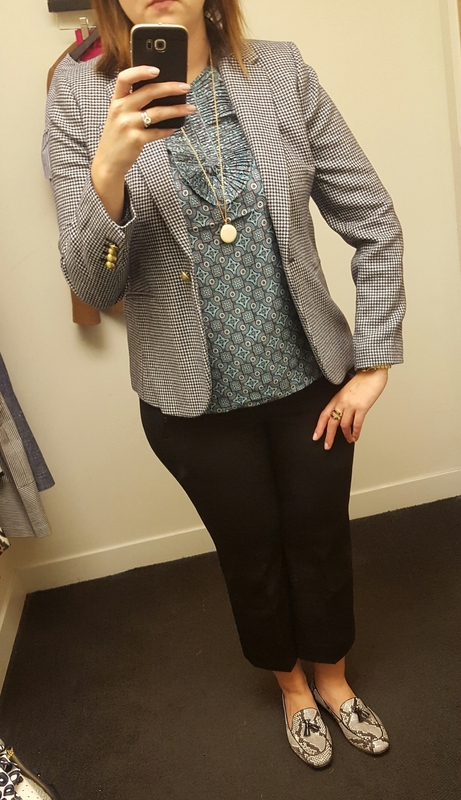 I do adore how it’s styled in the catalog with a black/white striped tee and dark jeans and I’ll be copying that look this fall regardless of if I keep this blazer. As I said before, I love how the style guide this season is refreshing some ways to wear classics. Ok, enough of pink, onward to the Tippi Sweater in Argyle in Black/Ivory. This also comes in cabernet/geranium (read: burgundy and pink) as well as elm/aqua (brown/aqua blue and what looks like a peachy color). I’m wearing a medium which is the smaller of my two sizes but I feel is the better size in the new style of Tippis. The wool is on the lighter end and seems to be less substantial than the regular Tippi sweaters. I have a few old school J.Crew argyle sweaters that I’ve found on eBay over the years so this isn’t a must have for me but it’s cute. The only reason I might go up to a large in this would be to prevent the pulling across my chest which is my main complaint when wearing argyle like this. It’s just what happens when you have a chest! Next up, the Margot Top in Silk Foulard. I’m wearing a size 12 in this blouse and would consider it true to size. The color is out of my general wheelhouse (blue/brown) but I love a good foulard print and J.Crew always nails it. I like that the ruffles aren’t over the top and while I don’t wear a ton of brown, I would wear this under a navy suit. The silk was substantial weight, and the colors are a little more saturated than they show in these photos. I also tried it with the Campbell Blazer in Houndstooth (shown below) and it looked good paired with that. I’m wearing a 10 in the blazer and I thought it seemed flimsier than most of their wool blazers and the wool is on the scratchier side but it is lined. It was lacking the structure I’d like in a blazer. It felt wimpy to me if that makes any sense. The houndstooth is navy and white. Last up are a few of the leopard items, starting with the Shift Dress in Leopard. This dress also comes in petite and tall. I’m wearing a 12 which is my usual J.Crew dress size. Oh, I don’t even know where to start with this dress. First, the material. It’s shiny and heavy and weird. 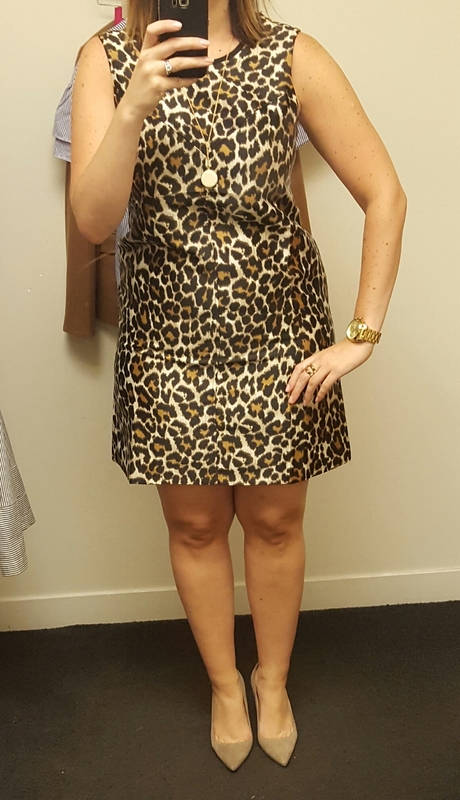 I love a good leopard print and this dress would have been so much cuter in a nice wool. The front chest area is also stitched in a v-pattern which doesn’t really add anything to the look of the dress. 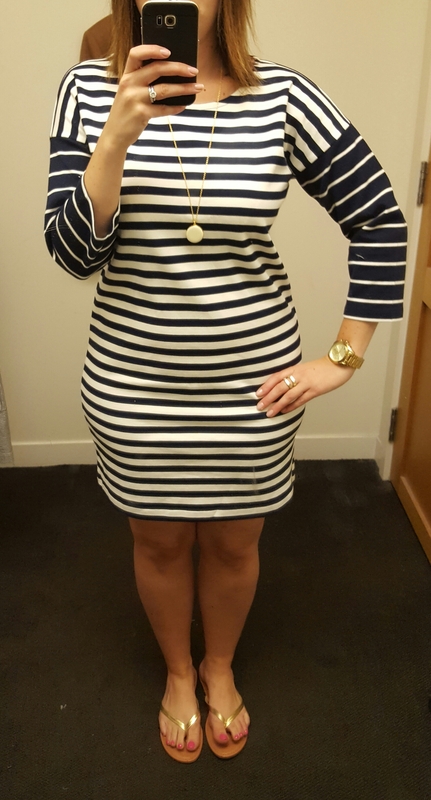 It fit like most shift dresses fit me – tight in the hips. Shift dresses are a style I shy away from and this dress will probably look good on people who look good in shift dresses. They’re not my thing. I do think paired with a black turtleneck and tights and booties it would be really cute for winter, but gah. The fabric. It reads cheap to me. The tie-waist skirt is the same material and given items with a thick waist tie don’t do much for my figure, I passed on trying on the skirt. I guess we can’t win them all, but J.Crew, this would have been so much better in wool. And lastly, the Lightweight wool Jackie Shell in Leopard. I tried a large in this since that’s what size I wear in the cotton Jackie shells (but still find to be slightly short). The wool shell was a little longer but ooh look at those big arm holes. Yikes. For some reason, I didn’t grab the matching Jackie cardigan in Leopard to try on but I’m usually a large in the Jackie sweaters. Arm holes aside, I like the print on these, and they are a nice lightweight wool. I haven’t bought any of the wool Jackie cardigans because I can do without the gold buttons, but on this leopard print, they pretty much blend in to the wool. If you can size down in the shell, that would probably solve the arm hole issue but I think the smaller size wouldn’t work with my bust. There you have it, the second half of my September catalog try-ons and I feel like I still have to get back to the store for one more round of perusing the store. As I said before, I foresee some closet cleaning come fall so I can focus on what I’ll be looking to fill in come fall/winter. Any of these your favorites? Not so much? Would love to hear what you think and thanks for visiting!! Love your honest opinions! I tried a lot on last week and was pleased with their new offerings. For the past few years I broke up with JCrew- we are getting along better now! Ordered the leopard skirt in a petite after trying the regular on in the store (too long) I have to say I really like the fabric because is is more season-less that wool. Living in Georgia I am always looking for those items that word 2-3 season. I like the sheen on the fabric, it seems like it will hold it’s shape, color and not fade. Thank you for the photo of the striped dress. I did not like it at all — for some reason, I balk at ponte, and I gotta get over it — but now that I see it on you, I love it. And I think it looks great on you, too.